The Manistee County Library on Maple Street offers many services for the community. The library has a knowledgeable and friendly staff to assist you with any type of research material or book. They can even get materials from other libraries. The library also has a selection of digital books which can be checked out for two weeks via a download to your electronic reader. All the Manistee County Library branches are equipped with computers for public access to the internet and Microsoft Office software programs. You may print from the computers for a small fee. The library also offers fax service, tax forms, and has typewriters available for patron use. Kids love the redecorated children's room at the Manistee County Library, and throughout the year they offer preschool story times and youth programs. The summer reading program is very popular, and there are non-internet computers installed with educational and fun children's games. The Friends of the Manistee County Library Book Lover's Book Sale is held every February, and includes a Bag Sale. It is held in the Red Book House behind the Main Library. The Friends also sponsor several other book sales throughout the year. February 9 & 10 - Book Lovers Sale, 10am-4pm. April 14 - April Showers Sale 10am-4pm. July 3- Forest Festival Sale, 9am-5pm. July 14 - Bear Lake Days Sale, 10am-4pm. September 1 - Summer's End Sale, 10am-4pm. 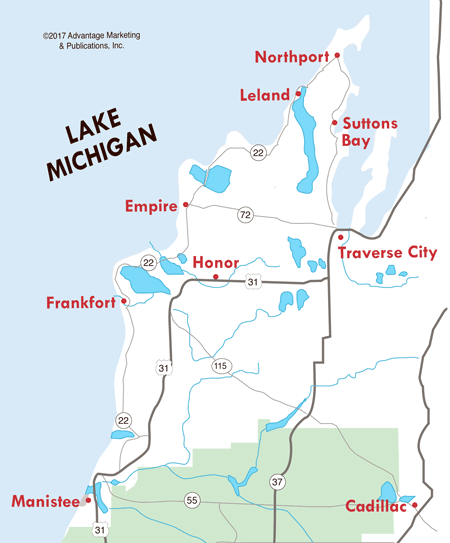 The Manistee County Library has locations in Bear Lake, Kaleva, Wellston, Arcadia, and Onekama. For more book sales in Ludington, Pentwater and Hart, see the schedule on our used book sales page. Things to Do in Grand Traverse County -- There's such a variety of things to keep you entertained while you're in the Traverse City area! Boredom is never a problem here in Traverse City!